DESCRIPTION: Wheelerville Road has a washed out bridge at the 5 mile mark and the Bucklin trailhead / parking area must be accessed from the Rt4 side. The parking area and trailhead contained trace to minimal snow. Followed the gated ATV road past a house / camp on the left continuing into the woods. In an open field the trail splits into a Y, it appears the traditional route takes the right fork towards the river. Continuing left will allow you to bypass the first water crossing. Take a right at the 2nd Y along the bank of the river. The 2nd, 3rd and 4th crossing were open water with treacherously stable ice bridges. Use caution! I was aboe to bareboot until the steep section just passed the 4th water crossing then wore snowshoes the remainder of the day. 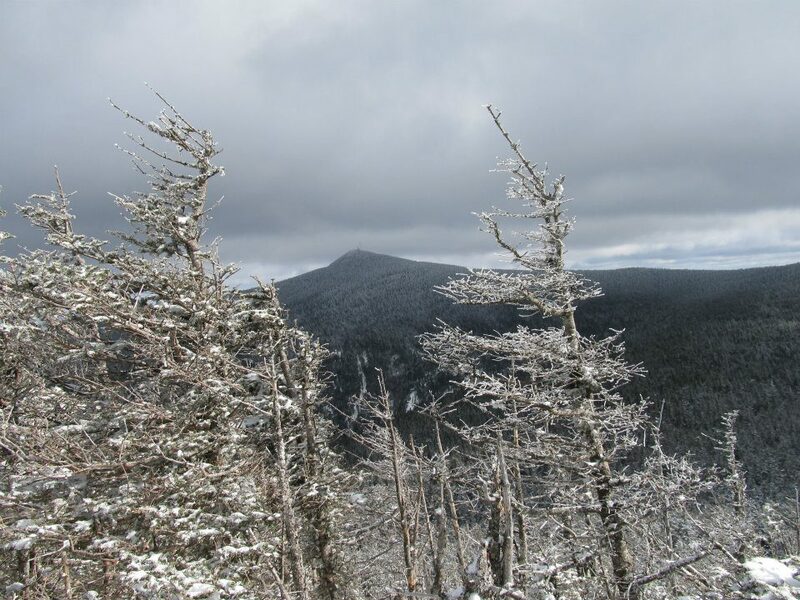 Follow the ATV trail to the height of land and col between Mendon and Little Killington then bushwhack approx 0.6 miles east to the Mendon summit. There is a false summit / highpoint approx 0.1 mi before the true summit and canister. Snow got deeper at higher elevations with 6" to 1 Ft depth. The bushwhack is mostly open woods with a few thick sections and blowdowns to avoid. Returned to the height of land and followed the ATV road along the ~3600 Ft contour towards Killington. Bushwhacked ~.3 mile to the LT/AT and followed it to the Bucklin Trail junction near Cooper Lodge. 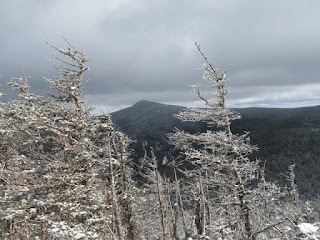 The last 0.2 mi pitch to the Killington Summit is steep and covered in ice. On descent the steep pitch was avoided by following ski slopes down to the summit chair lift and a short bushwhack back to Cooper Lodge. Descended the Bucklin Trail. NOTES / COMMENTS: The lower section of the Bucklin trail has been rerouted due to washout. It breaks away from the river and follows the nearby ridgeline for approx .5 - .75 miles before merging back with the original trail.